Coach Tite called up Renato Augusto and Alex Sandro to replace Phillipe Coutinho and Marcelo due to injuries. RIO DE JANEIRO, BRAZIL – The football (soccer) teams of Brazil and Uruguay face off in a friendly game on Friday (November 16th) at 8PM in London, or 6PM in local Brazilian time zone. Playing at Arsenal’s Emirates Stadium, the Seleção will be short of two starters: Phillipe Coutinho and Marcelo, due to injuries. 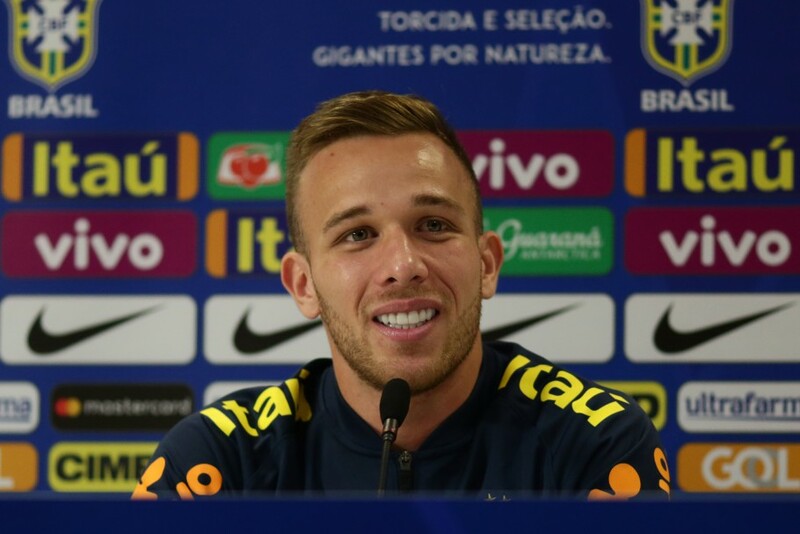 Arthur, who currently plays for Barcelona, spoke at a press conference yesterday, photo by Lucas Figueiredo/CBF. Coutinho, who has a left thigh injury, and Marcelo, who injured his right thigh, will miss the games. In a press conference yesterday Coach Tite called up Renato Augusto and Alex Sandro to replace them. Yesterday was the last training day in the Center of Training of Arsenal, and Tite was finally able to get all the players together on the pitch, including striker Richarlison and midfielder Arthur. Often described as an expert ball handler and passer, Arthur, who currently plays for Barcelona, ​​said that this quality is a consequence of the work of the coaches he’s played for. Team captain Neymar also spoke and took the opportunity to praise the Uruguayan attack duo of Suárez and Cavani. “They are two great stars,” Neymar admits. Brazil has won their last two friendlies against Saudi Arabia (2-0) and Argentina (1-0), after pounding El Salvador in September (5-0). Their last FIFA match of the year will be on November 20th against Cameroon. Previous articleOpinion: Brazil’s Bolsonaro – How’s He Doing?